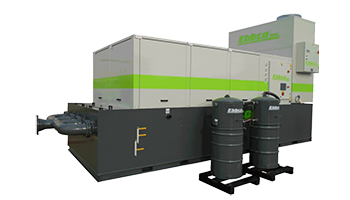 Ebbco Evomatic Central Automatic Backwashing Filtration Systems are custom designed to accommodate multiple grinding machines These units keep particulate from building up in the Machine Tool, Increase Fluid Life, Maintain Consistent Part Finish and Reduce Part Rejection. Internal Filter elements are designed to filter Carbide & PCD’s down to 1/2 Micron on Grinding Oil Applications. Various Chiller Packages such as Cabinet Mount, Drop-In and Heat Exchanger Packages Utilizing a Central Outdoor Placed Chillers are available. Central units can accommodate 5 to 30 Machines. Provide Clean Feed Pump Rates up to 500gpm and pressures up to 1000psi. Enclosed or Open Cabinet Styles Available. Optional Redundant VFD Filter & VFD Feed Pumps. Filter Vessel contain up to four micron rated filter elements from 1/2 Micron to 5 Micron. Heavy Duty Seal-less Filter Pump provides optimum flow and pressure throughout the filtration system. Clean/Dirty Tank plumbing packages keep particles suspended for removal and eliminating solid build up inside the tank. Pre-Programmed Backwash Intervals with PLC touchscreen programming. 55 Gallon Drum Sludge Receivers with custom built shroud to allow optimum sludge recovery. Redundant Filter & Feed Pumps Available. Optional Heat Exchanger/Outdoor Chiller packages available. Ebbco offers a free in-plant consultation to evaluate the process, layout and machines allowing us to offer the best options for proper filtration. By discussing existing and future production needs, this will allow us to offer options to eliminate downtime, remove excess heat from the building, and increase production by monitoring fluid temperature, flows and pressures to achieve a consistent and reliable source of filtration. Machines will be evaluated to eliminate down time caused by tank clean out, pump failure or temperature change resulting in tolerance issues. 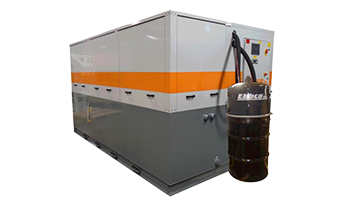 Central Systems capable of supplying up to 500 gpm clean fluid, are equipped with Self-Cleaning tanks, Redundant pumps and Chiller options are available. Optional 24 Hour monitoring of all systems functions with capabilities of sending notifications to Phone or Email to allow unmanned operations. 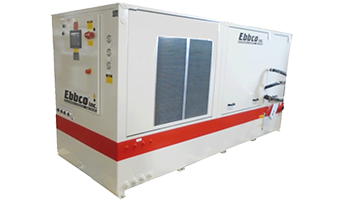 Precision Machining Filtration Ebbco Evolution and Evomatic Series Filtration are totally enclosed Filtration Systems designed for Precision Machining Application. Coolant Filtration Sludge Master Series Coolant Clarification Systems designed to prevent sludge contamination and extends coolant life indefinitely. Cartridge Filtration Single Machine Capacity Cartridge Filtration Systems Been Designed to Remove Particulate Down to 0.5 Micron. VMC/HMC Filtration Complete Pre-Packaged Filtration System Designed for Horizontal and Vertical Machining Center Machines. Prefilter Bags Micron rated prefilter bags for Evolution and Evomatic Series Filtration Systems. Replacement Filter Cartridges Pleated Paper Filter Cartridges, available in various micron sizes. Heat Exchanger Prefilter Protects the Chillers Heat Exchanger from Accidental contaminants. Way Lube Ebbco ClearWay is specially designed to not mix into water based coolants. The premier fluid condition solution for all industrial fluids. © Copyright 2015 - Ebbco, Inc.